WASHINGTON — The Trump administration is doubling down on its threat to cut off aid to the Palestinians if they fail to "sit down and negotiate peace," even as it proceeds with contentious plans to move the U.S. embassy to Jerusalem after recognizing the city as Israel’s capital. President Donald Trump said Thursday that U.S. aid to the Palestinians is on the line if their leaders boycott his administration’s efforts to negotiate a peace plan, insisting that the question of Jerusalem’s status is no longer up for discussion. 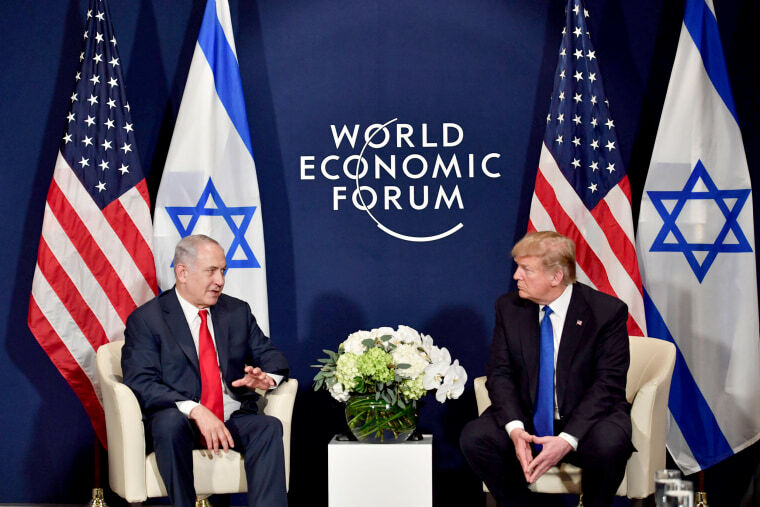 "We took Jerusalem off the table so we don't have to talk about it anymore," Trump said Thursday in Davos, Switzerland, during a meeting with Israeli Prime Minister Benjamin Netanyahu. "What I did with Jerusalem was my honor." Trump lashed out at the Palestinians following the bilateral meeting with Netanyahu on the sidelines of the World Economic Forum, saying the Palestinians "disrespected" the U.S. by refusing to meet with Vice President Mike Pence during his visit to the Middle East last week. Palestinian President Mahmoud Abbas instead met with European Union foreign ministers in Brussels. Aid money to the Palestinians "is on the table," Trump said. "That money is not going to them unless they sit down and negotiate peace." Speaking in Washington shortly after Trump met with Netanyahu, the Palestinian ambassador to the United States, Husam Zomlot, responded to the accusations. "No we did not disrespect anyone," he said. "We only respected. We respected ourselves. We respected our rights. … It is our people we are answering for. Not anyone else." In December, the Trump administration announced that it would break with decades-old policy and move the U.S. Embassy in Israel from Tel Aviv to Jerusalem, a move that could carry serious national security implications and block any genuine revival of an Arab-Israeli peace plan. Trump said Thursday that "a small version" of the embassy will open next year. "So that's a long time ahead of schedule," he said. Palestinians, who claim the eastern section of Jerusalem, captured by Israel in 1967, as their capital, were infuriated by the announcement and declared that they would not take part in any peace negotiations as long as the status of East Jerusalem is not addressed. East Jerusalem is home to some of the holiest sites in Judaism, Islam and Christianity, including the Temple Mount, Al-Aqsa Mosque, the Dome of the Rock and the Western Wall. The competing claims to Jerusalem sometimes spill over into violence, and the United States had previously withheld recognition of Israeli control of the area until there was a deal in place. In their meeting Thursday, Netanyahu hailed Trump’s efforts, saying, "You’ve made history and we will always remember that." "I say it pushes peace forward because it recognizes history, it recognizes the present reality, and peace can only be built on the basis of truth," he said. Tensions are on the rise as Trump’s son-in-law and top adviser, Jared Kushner, and Middle East envoy Jason Greenblatt shuttle back and forth to the region looking to achieve lasting peace between the Israelis and Palestinians. Trump has withheld any clear support for an independent Palestine and declared he could endorse a one-nation solution, although he has expressed more interest in an agreement that leads to peace than in any particular path to get there. In a speech announcing his intention to move the embassy last month, Trump said: "We are not taking a position of any final status issues, including the specific boundaries of the Israeli sovereignty in Jerusalem, or the resolution of contested borders. Those questions are up to the parties involved." In December, 128 countries of the United Nations voted overwhelmingly to condemn Trump’s decision to recognize Jerusalem as Israel’s capital, despite threats from the U.S. to pull funding from the world body. Nine countries voted "no" and 35 nations abstained, including Australia, Canada and Mexico. U.S. ambassador to the United Nations Nikki Haley said then that the United States would be "taking names" of those countries that symbolically voted the declaration "null and void" and that the U.S. would remember those votes when the U.N. asks for money. Despite ongoing threats by Haley and Trump to cut off U.S. funding for Palestinian refugees, the State Department recently prevailed on at least one front, proposing only a partial reduction in funding to the United Nations Relief and Works Agency for Palestine Refugees in the Near East (UNRWA). Last week, the State Department sent a letter to UNRWA notifying it that the United States will deliver $60 million in assistance for its programs supporting Palestinian refugees in Jordan, Gaza and the West Bank. That’s almost half of the $125 million the United States had been expected to deliver to UNRWA on Jan. 1. Haley wanted to eliminate all of the funding as punishment for Palestinian opposition to Trump’s policies, but the decision received pushback from the State Department, to which Haley directly reports, highlighting a lack of consensus within the administration. On Thursday, Haley once again addressed the issue at the United Nations, asking, "Where is the Palestinian King Hussein? Where is the Palestinian Anwar Sadat?" referring to the two Arab leaders who each signed peace treaties with Israel. Sadat was assassinated in the Egyptian capital shortly after signing the deal. She made no reference to Palestinian or U.N. aid in her remarks Thursday. "If President Abbas demonstrates he can be that type of leader, we would welcome it. His recent actions demonstrate the total opposite," Haley said. "We will not chase after a Palestinian leadership that lacks what is needed to achieve peace."